Most ingredients in this pears caramel pie are leftover that I need to use up before I go on vacation, I even use store bought pie shell, to make quick and easy. I have lots of fresh pears from my friend,and homemade kumquat candied in the fridge that I almost forget it's been there awhile :) so I add them to the pie as well. kumquat candied in this recipe is optional,but it taste really well together,maybe you can substitute with any little bit fruits candied for a taste. What's not to love this beautiful treat? I want one for my afternoon tea! I'd love to make this! Haven't used caramel before. And we don't get to buy the pastry shells in our stores:( Have to start from scratch. Your pie does look very tasty! With the leftovers you had, the pie was just a put together. Certainly its a gorgeous beauty with the pear slices sitting beautifully on top. I am so glad pear season is approaching! 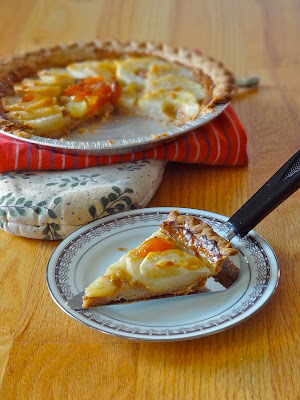 Your pie looks extraordinary with the candied kumquats AND caramel! Irresistible! Ridwan, I adore the caramel filling in your yummy, creative pie and the pear addition. So creative, pretty, and totally mouthwatering delicious! it looks so pretty and delicious too!